Orbital Marine Power’s next generation 2 MW turbine – the Orbital O2. Orbital Marine Power (Orkney) will fund construction of the UK’s first floating tidal stream turbine to go into commercial production. c2,300 individual investors invested an average of c£3,000, with over half investing via their ISAs for a tax-free return. Particularly strong support from investors in Scotland, investing the highest average amount at £4,500 each. Full £7 million target achieved on January 1st, getting green investment sector off to a great New Year. First green finance bond to realise the new maximum crowdfunded investment offer amount without a prospectus of £7m. 2019 looks set to be a top year for green and social investment as the UK’s leading peer-to-peer ethical investment company Abundance starts the year closing its largest fund raise to date, raising £7 million for innovative Scottish tidal energy company Orbital Marine Power (Orkney). 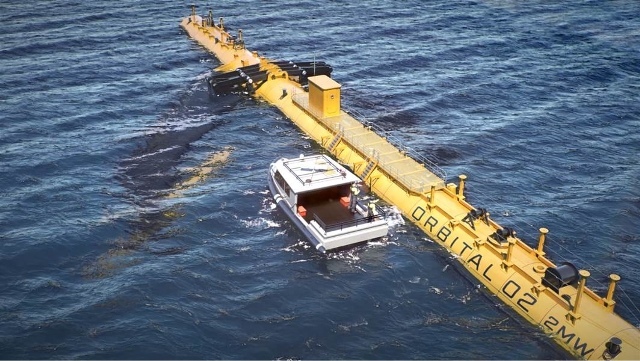 Orbital Marine Power (formerly Scotrenewables Tidal Power) will use the funds raised to build its first production model Orbital O2 2MW turbine, an innovative floating tidal turbine platform that can be towed, installed and easily maintained. The project already has secured a number of supporting grants as well as equity funding, including from the Scottish Government. The Abundance offer of 2.5-year debentures with an annual return of 12% attracted 2,278 individual investors, with over half investing via an Innovative Finance ISA for a tax-free return. The average investment was approximately £3,000, with the project attracting particularly strong interest from investors in Scotland who put in 50% more on average, at £4,500. With this new investment, Orbital Marine Power plans to build its Orbital O2 2MW turbine over the next 12 months, for deployment at Orkney’s European Marine Energy Centre (EMEC) during 2020. The Orbital O2 turbine comprises a 73m-long floating superstructure, supporting two 1MW turbines on either side. The new turbine will draw upon the success of Orbital’s SR2000 turbine which was launched in 2016 and produced in excess of 3GWh of electricity over its initial 12 month test programme at EMEC. Orbital’s floating turbine simplifies installation and maintenance as risky underwater operations can be avoided, keeping costs and downtime low, while floating systems can be deployed over a wide range of tidal sites in UK and global waters. Orbital Marine Power (Orkney) plc is a wholly owned subsidiary of Orbital Marine Power Ltd. The Orbital O2 2MW is also being supporting by grant funding from the EU Horizon2020 FloTEC: Floating Tidal Energy Commercialisation project, Interreg NWE Integrating Tidal Energy Generation (ITEG) and the OCEANERA-NET COFUND.